The car ahead of me slammed on its brakes so I did, too. My rubber tires screeched on the highway asphalt like a pterodactyl and I my truck started to spin. I heard my 13-year-old son shout, so I instinctively reached across the armrest and did my best to hold him in place. My truck spun across three lanes of traffic without hitting a single vehicle, then came to rest on its side in the ditch. That’s when my boy started to panic. Before I gathered my senses, he shot out of his seatbelt and fell into the backseat of my overturned truck. He made a mad scramble for the door behind me. I shouted for him to stop and he shouted that the truck was going to blow up. (That’s what I get for letting him watch too many TV shows.) I quickly undid my safety belt, turned, and clasped onto his arm with my right hand. The last thing I wanted was for him to jump out of the truck in a panic and get struck a vehicle on the highway. 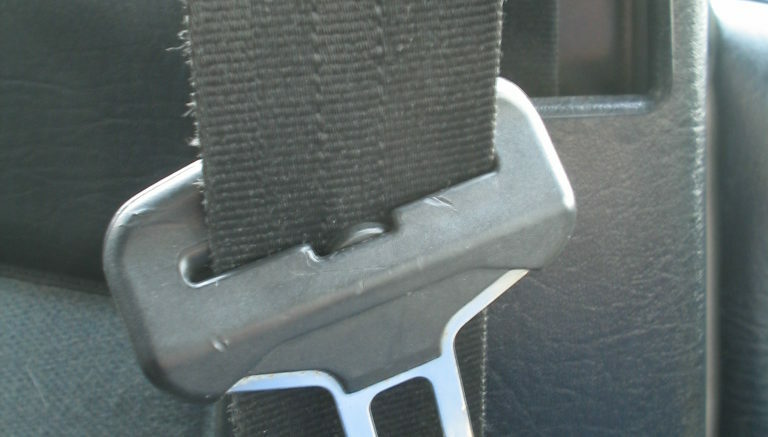 Cut your seatbelt so you can get out of it. Shatter the windows of your vehicle so you can escape the wreckage. Granted, this isn’t a tool that most people need every day. (Thank goodness!) But when you need an vehicle escape tool, you really need it. Nothing else will do. If you don’t have it, you’ll be stuck inside your vehicle until help arrives. If you happen to get into an accident along a well travelled highway, you can count on someone stopping to help you. What happens if you get in a wreck on a deserted country road and you can’t get to your phone? Uou’ll be in trouble if you don’t have a seatbelt cutter/window breaker emergency escape tool. This is why Solid Signal stocks this emergency escape tool from Tech Choice. It is both a seatbelt cutter and a window breaker thanks to a hidden razor and a tungsten steel head, respectively. Should you find yourself in an emergency situation that involves your vehicle, you use the car escape tool’s blade to slice through your safety belt. Once that’s done, you slam this window breaking tool’s pointed tip into the window or windshield. As you know, Solid Signal is an electronic products retailer. As such, this vehicle escape tool has another function. In addition to it being a tool that cuts seatbelts and breaks windows, it’s also a two-port USB charger. When plugged into your vehicle’s cigarette lighter, it charges two cellphones or other devices. (Any standard charging cable that you use with your device will do.) Its intelligent circuit provides maximum charging speed. It also protects it from under-voltage, over-current, and over-temperature. You can even charge both devices simultaneously. … Make sure you put it in a secure place in your vehicle. Why do I say this? It’s based on my experiences when my truck landed on its side in the ditch. Everything in the back seat ended up all over the dashboard and footrests up front. If your seatbelt locks and you can’t reach your vehicle escape tool, you might as well not even have it. Since it’s designed to be secured in your vehicle’s cigarette lighter, it probably best to keep it there when you drive. The connection should be strong enough to stay in place in an accident. If you have a locking armrest, you could put this car escape tool in there, as well. Solid Signal proudly carries this helpful and versatile emergency escape tool. It’s my opinion that everyone should have one in each of their vehicle. This opinion is the direct result of my experience, which could have been much worse. Look, it doesn’t take much to get into an auto accident these days. Even if you’re the most careful driver out there, you have no control of anyone else on the road. If you ever find yourself unable to get out of your seatbelt, this seatbelt cutter will get you out in no time. It’s also a window breaking tool, which is just as useful in escaping a car. Call us at 877.312.4547 to learn more about this car escape tool.